Tea is available in abundance in our home and in the homes of many of my extended family. When we arrive at each other’s houses, we have tea. When we get up in the morning, we have tea. Afternoon? We have tea. After dinner? Tea. When we’re happy, we have tea. When we’re sad, we have even more tea. When we’re angry – you guessed it, we have tea. Memories of tea and tea parties are many, but one favorite comes from when our children were little and we had traveled from Boston to Cairo after a vacation in the US. We were experiencing full-on jet lag and 3am Cairo time had all of us up and wandering the fifth floor walk-up apartment that we were living in on the island of Zamalek. What did we do? We had a Jet Lag Tea Party. It was the perfect solution. We come by this love of tea honestly. There is no physical way to avoid tea in the subcontinent. It was, and is, integrated into all of life in Pakistan. During my last time in Pakistan, in the middle of treating patients for malaria and malnutrition, in temporary tent-like spaces with temperatures of 100 degrees Fahrenheit, we were served hot chai (tea). It was made from strong Lipton gold, with a heavy dose of sugar and full cream buffalo milk, and served every day around 11 in the morning. It was an amazing act of hospitality from people who had almost nothing and were picking up the pieces after the devastating floods that came over villages and towns. Why did they do this? Because they are hospitable and tea is a way of illustrating this kindness. Because they couldn’t imagine us going all morning without tea! For me the tea was symbolic that we could go on. We could move forward and do the job we had to do. And that’s what tea has been in my life. You allow yourself the luxury and healing of tears, you have a cup of tea, whether it’s regular, mint or vanilla rooibos, and then you continue to face whatever there is to face. Sometimes it’s as helpful as an hour counseling session, only cheaper. This week I received the card above from my younger daughter, Stefanie. 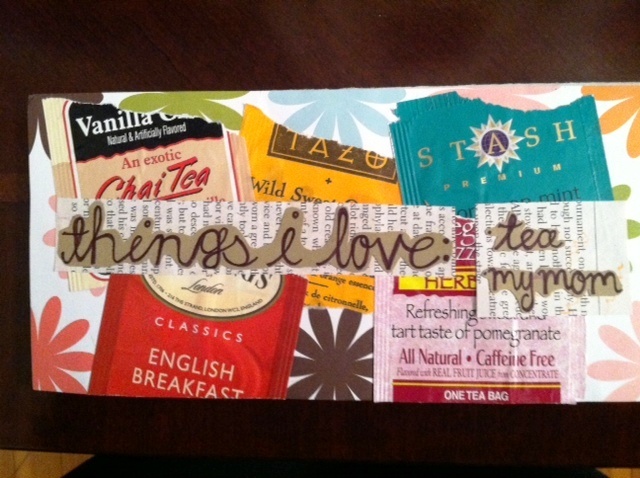 Made of the wrappers of tea bags, it was a perfect sentiment of two of my loves and two of hers: Tea and Moms! What about you? Are you a tea lover? Did you grow up with tea or was it an adult pleasure? Join in through the comment section. And a Happy Weekend to you! May you have the luxury of enjoying a pot of tea! < Previous Guest Post: You Know You Live Downtown Cairo When…. When in Poland for the day, I helped my daughter pick out a tea pot. She then picked out an assortment of cups to add variety to her already growing collection. Then back in Prague we stopped at a tea shop to buy fresh tea. Though we would have a fresh cup of French pressed coffee each morning (oh how I love fresh coffee, too) it was such a blessing to end the day with her sharing a pot of tea. Lovely post, and wonderful comments. And I must add that when I spent time in South Africa in 1999, I was introduced to Rooibos tea. At that time you could not find it in the states and they would send me a box now and then. It is at our fingertips now with added flavors, but that first pure Rooibos tea together with friends at afternoon pudding or the close of the day was a delight. Here’s a piece I wrote a few months back for a class–something to say me. Tea–my “go-to” for every occasion and metaphor for qualities that I find important. Tea meant comfort and happiness in my early memories of Pakistan: sweet and milky, sitting in my beloved nanny’s lap; a strong brew capping off my first exciting day at boarding school; the mad rush at break, when I was finally old enough to get my tea from the hole-in-the-wall stall across the road. As a newly-married bride, my mother-in-law introduced me to ritual and reverence through the very rare occasions when we used her exquisite collection of bone china cups. We carefully warmed the pot while boiling the water. We added just the right amount of leaves and waited patiently for it to steep. Aaaah….the perfect cup. When life and ministry took me to the frontiers of Laos, I traded delicate cups for floral- patterned china mugs each one unique. They reminded me to look for the beauty all around me—be it the landscape or in the variety of people with whom I shared a cup. Each person and scene had a beauty of their own to be savored and appreciated. In my newly nomadic life, a delicate china mug accompanies me. I love sipping from it as I share the pre-dawn hours with Jesus. This delicate mug, so easily chipped, reminds me of the importance of soul care. Each reverent sip is an in-pouring of the Holy Spirit, a source of strength for what my day brings. Now, instead of my beloved nanny, I feel the warm embrace of Abba Father. Crossing both the globe and the span of time tea remains my constant companion, its symbolism and meaning growing and changing. For today it means warmth and comfort, sacred ritual, unique beauty, and God’s goodness. Life is richer over a cup of tea. I wish I could hit like for your comment. It is beautiful and touched me deeply.”In my newly nomadic life, a delicate china mug accompanies me. I love sipping from it as I share the pre-dawn hours with Jesus.” This part was a touching encouragement for me to sit awhile, right now, albeit with possible a fresh cup of coffee, but maybe this time I will make it a fresh cup of tea. Thank you for sharing your words and story. Jesus always loves for us to sit awhile with him. Anytime of the day or night. And I’m sure it doesn’t matter whether it is tea or coffee, or something else. It’s much more about what it symbolizes for you. I hope you felt His quiet loving presence. A few years ago caffeine had to be eliminated from my diet. Hooked on both coffee and tea (chocolate, too!!) I had to let it go. Decafe doesn’t taste quite the same. Nevertheless, I have experimented and found a few brands, that properly brewed, satisfy. As tasty as a good cup of hot tea (chai included) might be, the presence of good friends makes it even better! That’s not to minimize the benefits of a cup of tea when alone. There’s just something about tea that is more than habit!! Oh, and bring on a batch of hot scones, cream and strawberry jam or lemon curd. Voila! I love tea and chai also. I love the warmth and always end up cradling the cup between my hands for extra warmth. There’s something about it that helps make everything better (especially if you’re able to have it with cookies or cake)! I love that too Sheila. It’s one of the side benefits of a warm cup of tea or as you point out, chai. There are these dunkers that we get that are hard and sweet and perfect to dunk in a cup of hot tea. And today is really cold so that’s what this afternoon will hold. Thanks for reading. So true Stan, unless you find a good batch at an Indian store. Tea seems so weak here. So can I request a box? Hi, Marilyn. I am new to your blog and learned about it from Robynn. I always loved the idea of tea time because of Jane Austen novels, but did not experience it until I had the privilege of living in South Asia and working with Robynn’s parents. A little girl back in the States asked me for a Pakistani recipe and I sent her a recipe for chai, complete with buffalo milk. Her mother told me that she went to every store in her town and asked them if they carred buffalo milk so that her chai could be authentic. Since then I have lived in North Africa where they drink very sweet green tea with mint. I loved their tea, (and they loved the fact that my kids and I loved it), but I am glad to now be surrounded by South Asian immigrants who have reintroduced me to the joys of chai. God created the beauty and majesty of nature to remind us that He is in control and that we don’t need to worry. I think He created tea for the same purpose. Just relax, trust God and have a cup of tea. Everything will be all right. I love this Tiffany! I love the way your love of tea evolved from Jane Austen to Pakistan and Robynn’s parents (who I love, by the way!) to trying to integrate others into the love, to mint tea in North Africa, and now to reintigrating the love into the society you where you are now. Beautiful picture of the way tea follows us, as does God. We were in Cairo for Christmas and one of the highlights was our nightly routine at various coffee shops sipping sweet mint tea. I’m so glad you read and commented. It was one of the many special things about visiting Mom. Anything was an excuse for tea and bringing out her beautiful individual decorated china cups and saucers added to the occasion. Yes to china cups. I think it must have been the influence of the sub-continent because my mom is the same. Tea in mugs just doesn’t have the same affect as tea in fine china. And I love the way none of the cups are the same. Tea and moms indeed. I was spoiled, so thoroughly spolied! Could not open my eyes without my bed tea. Once mum was away for a week, there was no maid for some reason, so dad brought us tea then.One of my most touching memories of him. I and my sis could not believe that dad was making bed tea for us. In my in-laws place tea is sacred. If one person needed a cup of tea, enough was made for the whole family and extended family. There was always someone or the other living with us. Spoiled even now, hubby makes tea many times in the morning as I force my blurry eyes to focus. It may seem sacrilege to tea drinkers everywhere that I have kept my kids away from tea addiction but I thought it best. ha ha it is funny considering their heritage. Having my tea as we speak, the English way, with ( ok doing the diet thing so light creamer and stevia) but it just feels naked without it! :) My whole family does coffee and I the lone ranger does tea! Lovely post and lovely card, your daughter loves her Mama, that is how it should be! I adore tea parties, when my Daughter comes here, she drinks tea…not coffee, but when I got there, she is all about coffee, it’s funny! :) When we fly together, I have been known to have a cafe mocha, it’s our ritual but I admit, I am a tea drinker all the way. I have just expanded,I was an ‘ earl grey’ that was it, nothing else! I am learning to appreciate all other tea, my sister the coffee drinker does also drink tea, and when I go there, she has the expanding collection so it’s fun, that was where I first found the ‘ flower’ tea, It was SO cool, to watch a flower grow, amazing! So, I am learning! People do think it’s crazy to put the milk in first…and always have a biscuit! Somehow I knew you’d love tea parties! I still love my tea. A day just isn’t complete without it! Now, I am enjoying the pleasure of building relationships with my Nepali friends – you guessed it – around mugs of delicious, steamy Nepali tea. The language barrier matters less as we share something so special from their longed-after homeland. They are always thrilled as I make it clear that I love their tea, and if I let them, they would serve me mug after mug of the delicious chai. I think I saw one of your tweets the other day and vaguely thought….”Jessica loves tea! How cool…!” The child hood memories are so true – I felt the same. Tea cups, pots and the steaming hot goodness that filled them. It did feel grown up, didn’t it? But you bring up one of the best things about tea, the way it fosters relationships. Thank you! Lowell always laughs that in British television the cup of tea solves all ills. If it’s a WWII film and invasion is imminent —they have a cup of tea. If it’s a modern intense drama and they’re trying to flush out the bad guy–they have a cup of tea. If someone is dying of a dreaded disease—they have a cup of tea. But I understand the comfort of tea. Our own family responds in similar ways. A couple of months ago my parents rang from Canada to say that their house had been broken into. Understandably my dad was shocked and enormously upset. I wanted to be there. I wanted to make the tea. Instinctively I told him to sit down and have a cup of tea. His response was, “Oh Becky’s here. She’s been so kind. She came in and put the kettle on and made us a cup of tea. We’ll be alright.” The tea was the calming substance. In the steeping there is stillness and pause. There is comfort and calm in the holding of the hot cup, in the sipping there is relief, in the steam there is release. And for those of us who routinely drink tea there is the rhythm of tea time. It brings order and predictability. There’s nothing quite like it really. Yes Robynn! Rhythm and Predictability. Your comment is like a poem – so beautiful. I think when I feel helpless in helping others, the idea of making them tea feels like a balm for both of us. I had never realized that about British shows but so true!! I think I saw surgery stop once for tea …. but that was in Pakistan. Everyone who has lived in South Asia can relate to your blog today. Here in the US we’ve gotten away from tea breaks, but our recent 5-week visit to Mongolia brought it back again., Our Scots daughter-in-law called us to tea monrning, afternoon and night! It’s a wonderful custom and we miss it here. Lovely Hu! I still remember sitting on your wide verandah in Shikarpur on the wicker couches and having tea. So glad you had opportunity to reexperience in Mongolia. I’ve drunk a fair share of tea with Fiona as well but not for a long time. We’ll have to change that. You need more than two cups Ed, you’re caring for teenagers!